Bluffton’s Katie Prater makes her way past Fort Jennings’ Kristen Luersman on Wednesday night during the Division IV Sectional Tournament at Bath. Bluffton’s Laykin Garmatter comes up with the loose ball against Fort Jennings’ Madison Neidert on Wednesday night during the Division IV Sectional Tournament at Bath. BATH TOWNSHIP – Bluffton bounced out to a big early lead. 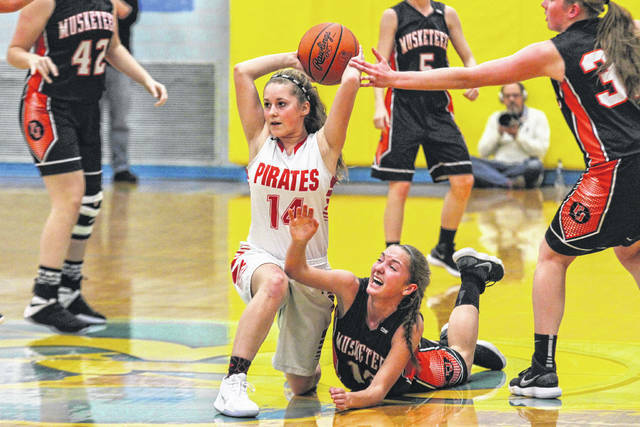 Not only was that good for the Pirates, it also helped relax Alivia Koenig and her quest for 1,000 points. 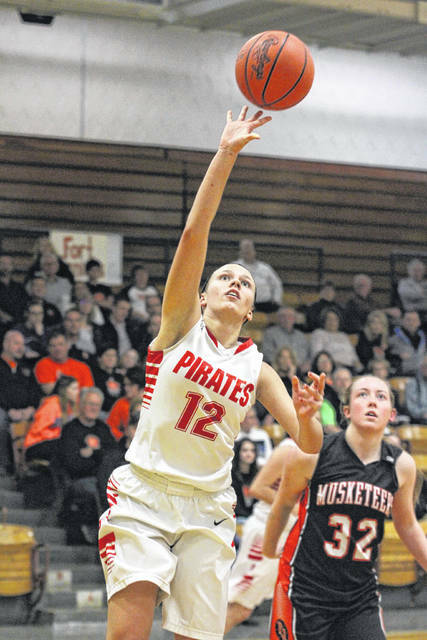 Koenig settled in and scored her 1,000th point in the third quarter to help Bluffton post a 53-37 victory over Fort Jennings in the opener of the Division IV girls basketball sectional tournament Wednesday at Bath. Koenig, a junior point guard, needed 12 points to reach 1,000 points for her career. She posted the historic basket after grabbing a rebound off the floor and going end-to-end for a layup with 3:57 left in the third quarter. That gave Bluffton a 32-20 lead. After Koenig scored her 1,000th point, the game was stopped and she was presented with the game ball. Koenig then went over and hugged family and friends in Bath’s first row. Koenig finished with 14 points and five rebounds. Bluffton’s Libby Schaadt had 10 points. Kayla White had nine points with three 3-pointers. Katie Prater also had nine points. Kristen Luersman led Fort Jennings with 16 points. MaKenna Ricker had 15 points with three 3-pointers. Bluffton (17-6) advances to the sectional finals against No.2-seed Columbus Grove (13-8) at 6 p.m. Saturday at Bath. Fort Jennings ends its season 6-17. Bluffton ran out to a 12-0 first-quarter lead. Fort Jennings missed all 12 of their shots in the first quarter before finally breaking the drought early in the second to make it 12-2. Bluffton got its running game going in the second quarter, with the help of its 2-2-1 press. Bluffton had six baskets in the second quarter and all came on layups against the Fort Jennings’ 2-3 zone. The Pirates led 25-13 at the half. “We always want to drive to the basket first, then kick out for the threes,” Garmatter said. Koenig had five points at the half. She then added seven points in the third quarter, including a 3-pointer. The closest the Musketeers would get in the second half was eight, 35-27, with 40 seconds left in the third. White then sank a 3-pointer to give the Pirates a 38-28 lead after three. That also triggered Bluffton on a 16-5 run to help it pull out to a 51-32 lead with 1:32 to go. Bluffton’s defense forced 17 turnovers for the game. Bluffton had nine turnovers. https://www.limaohio.com/wp-content/uploads/sites/54/2018/02/web1_Bluffton-vs-Fort-Jennings-GBB-7811-1.jpgBluffton’s Katie Prater makes her way past Fort Jennings’ Kristen Luersman on Wednesday night during the Division IV Sectional Tournament at Bath. https://www.limaohio.com/wp-content/uploads/sites/54/2018/02/web1_Bluffton-vs-Fort-Jennings-GBB-7879-1.jpgBluffton’s Laykin Garmatter comes up with the loose ball against Fort Jennings’ Madison Neidert on Wednesday night during the Division IV Sectional Tournament at Bath.